Welcome to our 5-part series on how to remove the most common kids’ messes from your home! 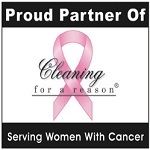 We will cover walls, leather, fabric, wood, and carpet. 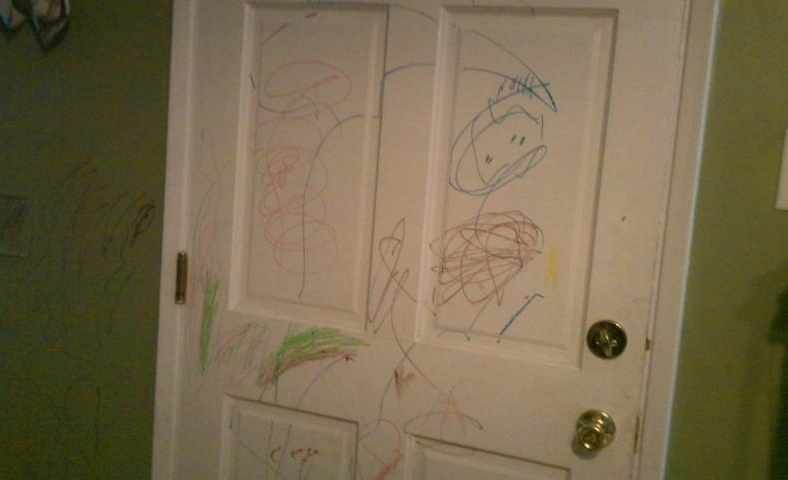 In each post, we will talk about removing crayon, marker, stickers, and food stains. We hope you enjoy, and if you have any great tips you would like to add, please feel free to let us know in the comments! 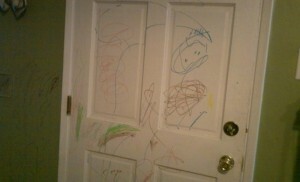 Children love creating works of art on walls. Who can blame them? They’re giant blank canvases just waiting to be (ahem) improved upon! But don’t worry, when the glory of their accomplishment fades, and it’s time to bring your walls back to their intended look, there’s usually a way to clean it without needing to paint over it. Of course, sometimes that is not the case, but it’s always good to give it a try before resorting to that measure. Crayon can be easily removed from your walls with a clean, damp cloth with a little bit of baking soda sprinkled on. If there’s any left, you can lightly use a wet magic eraser to remove the rest. Magic erasers work well on walls, but you want to be sure not to use too much pressure, because depending on the age of the paint it could scrub some off as well. You can find other helpful suggestions Here. Any type of marker, whether it be dry erase or permanent, can be a little more challenging to remove. We have found that a little bit of plain, white toothpaste (paste, not gel) with a wet magic eraser will do the trick. If that doesn’t help, try gently rubbing the area with a damp cloth with rubbing alcohol. Little ones think stickers are amazing, and should be EVERYWHERE. To remove, simply blot baby oil on and around the sticker with a cloth, let sit for about 15-20 mins, and it should peel right off. Immediately remove the baby oil with a clean, damp cloth and a mild dish detergent so it doesn’t leave an oil stain.